PALM PROTECTOR TRAINING GLOVES: finally, a functional and comfortable pair of fitness gloves. Our Mava training gloves with silicone padding provide full palm protection against abrasions, scars, hand tears, calluses and blisters. No more slips and reduced friction while gripping exercise equipment or doing bodyweight exercise sessions. INTEGRATED SUPPORT FOR WRISTS: prevent wrist strain and promote wrist health by using our Mava gym gloves. Simply reduce the risk of injury to your joints by providing a good support while focusing on your training. STRONGER GRIP and MOBILITY: our Mava workout gloves will give you a natural grip on the bar, boosting your grip and mobility. Find the best contact points, flex and bend your hands freely to focus on your training. Don’t worry about chalk or taping but work on your grip and the rest of your muscles. RECOMMENDED FOR: Gym workouts, weight lifting, HIIT, resistance training, kettlebells and dumbbells, time crunch, circuit sessions, bodybuilding, body weight exercise, endurance, power lifting, power cleans, Oly lifts, deadlifts. Very versatile gym gloves designed to improve your performance. Mava Sports is proud to bring you the best training gloves on the market. Our Mava protection gloves were designed to solve all your past frustrations, allowing you to train better, more efficient and focus on your performance. Created for training newbies and athletes alike, the Mava men and women workout support was built to reduce hand rips and offer the essential wrist strength you need to focus on your form and results. Stronger Grips, no Slippage: Their ingenious palm design is made from high quality Silicone which guides you into finding the best contact points and minimizes grip loss. So grip more, lift more! 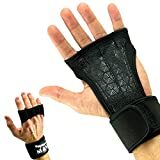 Integrated Wrist Wraps for Better Stability: Adjustable wrist wrap provides maximum stability and support, giving you confidence for that last rep.
Palm Protection Grip: Thoughtfully made palm design prevents abrasions and blisters, allowing you to not postpone any more workouts. Sweat Protection: Ultimate design made to combat sweat. Eliminates annoying slippery feeling and gives you a better grip thanks to their breathable materials. Or Mava silicone training gloves are suitable for men, women and teens who want to better focus on their exercise sessions. Our customers use our awesome Mava weightlifting gloves for intensive workouts, weightlifting, bodybuilding, training sessions, heavy fitness and even cross training and rope climbing. But they are also great for rope climbing, weightlifting, strength training, kettlebell workouts and many other types of training.